A little innovative piece of marketing. Baggage tag kind of thing attached to executive lunch boxes delivered to office areas. This is my office colleague’s dabba (lunch box) which gets delivered by the Mumbai Tiffin Service. 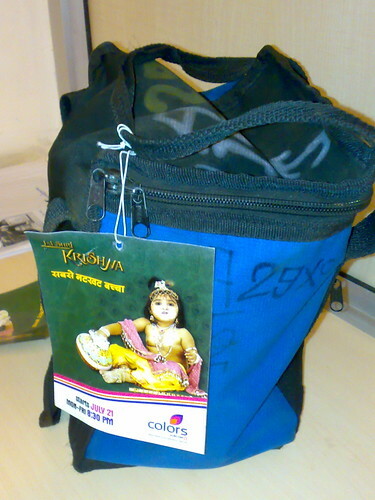 The tag promotes “Jai Shri Krishna” serial from the new TV channel colors (viacom18) which launches today. I am not surprised Kapil – I manage HCL brand and part of my job entails to handle advertising as well….Colors has been sending me sms as a follow up to their programs incessantly…its no surprise …since the channel comes from Marketing savvy group Viacom 18! Interesting form of viral marketing.